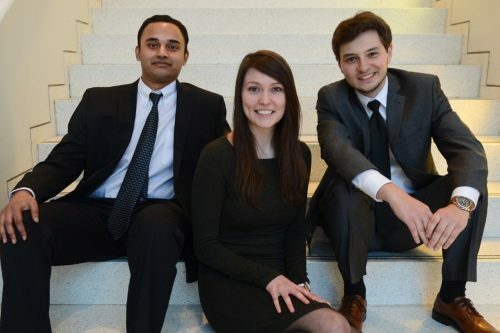 Pictured here are Thiru Vikram, Emilie Reynolds, and Alexander Zhitelzeyf, who took first place in UB’s Henry A. Panasci Jr. Technology Entrepreneurship Competition, which is supported by the UB Foundation. Photo by Nancy J. Parisi. The Henry A. Panasci Jr. Technology Entrepreneurship Competition brings together UB students from science, technology, business and other disciplines to maximize their potential and create viable businesses in Western New York. Created by the UB School of Management and the UB Office of Science, Technology Transfer and Economic Outreach, the Panasci competition was funded with a $1 million endowment from the late Henry A. Panasci Jr. This endowment is managed by the UB Foundation. We spoke with Alex Cleary Pelc, Senior Program Coordinator for the School of Management’s Center For Entrepreneurial Leadership, about the impact of the Panasci competition. Here’s what she had to say. What impact does the Panasci competition have on UB and the community? 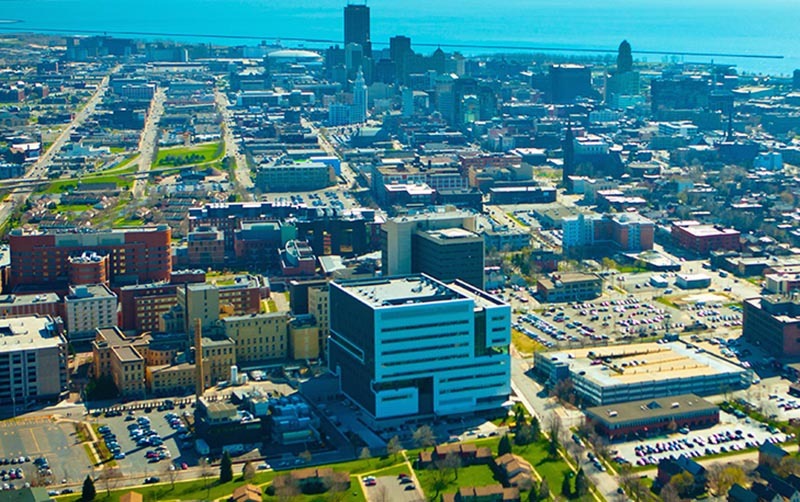 Why is it important to encourage entrepreneurship at UB and in the community? Pelc: The competition validates entrepreneurship as a viable career path and also encourages our students to think ‘intrapreneurially’ within the larger organizations they may work for in the future. It’s important that we teach our students to innovate in their chosen fields – the students competing are given the opportunity to think through the process of bringing a product or service from conception to market. Additional learning takes place by combining students into teams comprised of both technology and business expertise. This helps them learn how to build and work in multidisciplinary teams, capitalizing on each other’s skills. How does the Panasci competition help the university achieve its mission? How does the endowment support the Panasci competition? Pelc: The endowment enables us to award top teams in the competition seed funding to start their businesses. It also provides an invaluable experiential learning experience for students through the many rounds of pitching, feedback as well as access to community business leaders for mentorship and in-kind sponsorships. Why is private support so important to a public institution like UB? Pelc: It allows us to offer extracurricular activities focusing on experiential learning that broaden the student’s capacity to identify think through complex situations using creative problem solving skills, building teams and identifying market opportunities all while still being in the supportive environment of the university. What are the benefits of donors being able to direct their funds for a specific purpose, like the Panasci competition? Pelc: When donors direct funds for a specific purpose they have the opportunity to directly impact UB student’s experience that aligns with areas that the donor may be passionate about. What would you say to the donors who have helped support the Panasci competition? Pelc: We would say THANK YOU for the incredible generosity that encourages and promotes the idea of entrepreneurship to our students as they pursue their education. These experiences will help shape the way they innovate and work in their future careers, whatever they may be. Henry A. Panasci Jr., B.S. '52 & B.A. '48, was the former chair and CEO of Fay's Incorporated, a diversified specialty retail chain. By the time Fay's Drugs merged with Eckerd Drugs in 1996, the chain had expanded to 275 drugstore locations, with more than $1 billion in revenues. A very active UB alumnus, Panasci was honored with the UB Alumni Association's 1998 Samuel P. Capen Award. Panasci passed away in 2005.